It was slow-going today because of the hills and because of the sun. Arizona is a beautiful country, reminiscent of the many TV Westerns I watched as a boy. I was typically mounted on a green leather hassock (my saddle) atop a dining room chair (my horse) in front of my grandmother’s small screen television. The good guy always shot the gun out of the bad guy’s hand or rode his horse next to the other guy’s horse and they fell off together and had a short fight ending in Hopalong or Gene or Roy saving the day. This morning I met Rory, 32, cycling from LA to the East Coast via Nashville, looking to find meaning in his life. Later, at Hackberry, I chatted with 3 tourists from Holland (in Dutch my name means “shoe” so they always assume I’m of Dutch heritage). 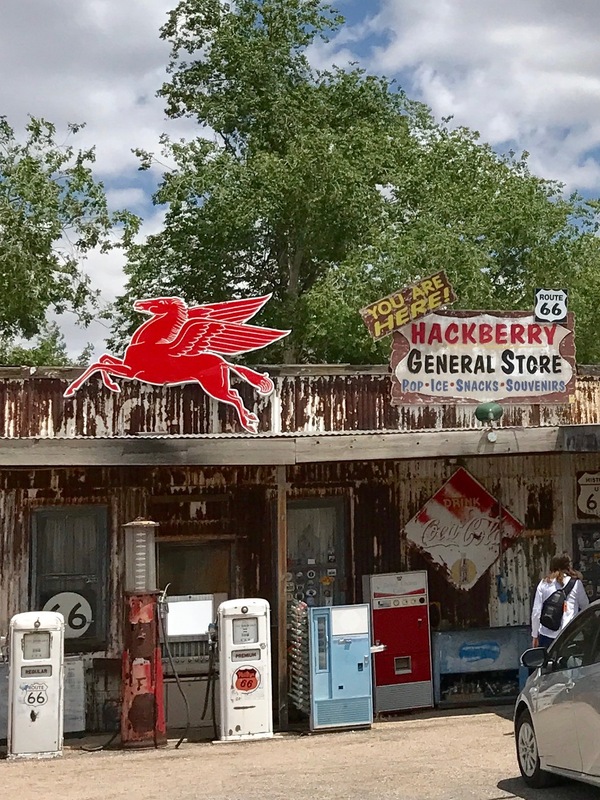 The Route 66 ghost towns are a mixture of convenience food stores, old rusted cars, schlock, and kitch, with tourists coming from or going to the Grand Canyon. I’ve seen a number of leather-clad French tour groups riding Harleys. Mais oui. I rested in the shade and took a selfie on the grounds of the Dept. of Interior, Bureau of Indian Affairs. Later I spoke with Al, cycling round trip from Kingman. Like myself, he’s 70, working to stay fit and trying lead a meaningful retired life. I set up my tent near the town of Crozier after logging 16-18 miles today (I have no cell service so I can’t be sure). In spite of the sounds of cars, trucks, and trains, it’s peaceful lying in my tent, waiting for the sun to go down.